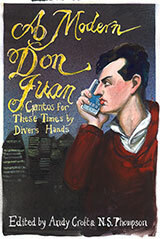 Two hundred years after Byron turned his back on the hypocrisy and cant of his native England, fifteen contemporary poets pay homage to Byron’s greatest satirical creation by writing a new Don Juan for our own age of cant. Mixing Low Comedy and High Seriousness, the book follows night-club DJ and picaresque anti-hero Donald Johnson as he stumbles from one romantic disaster to the next. Along the way, the authors pass comment on the customs and common-sense of the contemporary world. Donny seeks his fortune in Cameron’s Britain, Berlusconi’s Italy and Sydney’s clubland. He is a London restaurant critic, a Brussels Eurocrat and a reality TV celeb. If you are quick you can catch him in Greece, Budapest, Central America, a prison cell – even in Outer Space. The contributors are Ben Borek, Andy Croft, Claudia Daventry, Ian Duhig, Rachel Hadas, WN Herbert, George Jowett, John Lucas, Amit Majmudar, Sinead Morrissey, Alicia Stallings, George Szirtes, Nigel Thompson, Tim Thorne and Mike Wilson. For telling you) it’s run by merchant bankers. So here it is in verse: a votive book. Among the protests in Syntagma Square. The Cameroons not quite your kind of folk. They’re all mad, bad and dangerous to know. And poetry these days would make you snore. The follies of your Age and ours combined. To know by heart a quote or two by Gandhi. If only you were living at this hour. In urgent need of poets to scourge its failings. And bring him up to date and up to speed. We still can’t match what you caught single-handed. Without the help, this time, of Leporello. Because we are not you (or Tony Harrison). As far as you’re concerned – the job’s a good ’un. This fifteen-piece Lord Byron tribute band.